The coming of the Grand Junction canal (Grand Union) to Leighton in September 1800 changed the geography of old Linslade considerably. 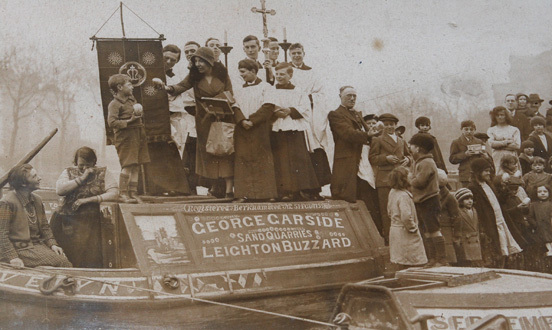 Early boatpeople were still using the canal side church of St.Mary’s at Old Linslade and J.Arnolds (pit owners) were loading sand at Sandhole bridge (B110) north of what is now Leighton Buzzard. New industries and wharves were quickly developing further south on the canal where the modern town is now. In 1792 a well attended meeting of canal investors was held in Stony Stratford with strong support from the Marquis of Bedford, who eight years later greeted the first boats to pass through Leighton from Tring on route to Fenny Stratford. 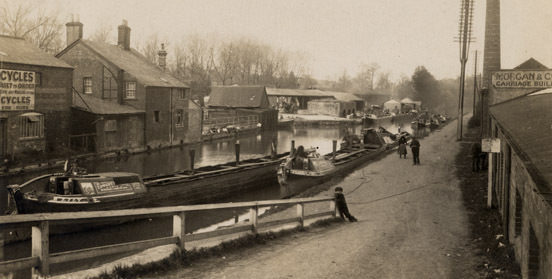 Linslade had already been influenced by the coming of the canal with a large influx of itinerant labour (navigators) and their families, craftsman to build the bridges and aquaducts and locks and surveyors and overseers to manage the “Grand Canal”. Canalside industries consisted of limekilns, coal and grain merchants,engineering companies, haulage and packet boat companies as well as the administrators of the canal such as wharfingers, lockkeepers ,canal police, lenghtmen and toll clerks. Local sand producers did not start using their own boats until the 1890s when wide beam boats (wider than seven feet) were introduced. As the numbers of boats increased, narrow boats replaced the wide beam and engines replaced the horses. Arnolds loaded their boats from a northerly wharf close to bridge 110 which served their pits in the Heath and Reach area. Transport was always by road using carts but sand was also moved by rail to Sheep corner (Heath and Reach) and then loaded into carts. Later lorries were used. By the early 1900s sand of all grades was regularly shipped to London and the Midlands and a peak tonnage of 40,000 tons was shipped south in 1912. Garside’s alone shipped a total of 17,068 tons in 500 boatloads in 1912. 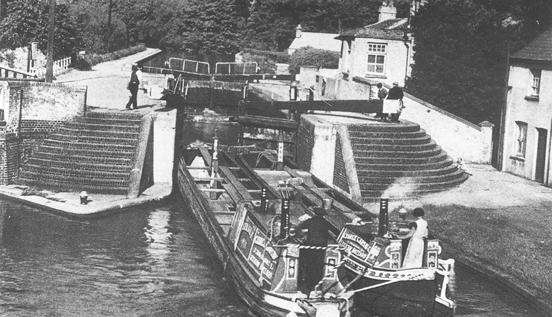 But, steadily, rail and road transport reduced canal use and Arnolds finally gave up using boats in the 1930s whilst Garside’s continued into the 1950s, which was also a period of national decline in the canal system. An Aylesbury canal haulier, Arthur Harvey-Taylor, continued sand shipments to Paddington and in 1952 1,470 tons was moved using five pairs of boats. By 1962 only 800 tons was being moved by the Barlow carriers and the sand was now moved to the wharf by road transport following the closure of the Light railway in the early sixties. Canal transport of sand had provided early employment for William Vaughn of Friday Street, Leighton, in 1929, when he worked with his father on horse drawn canal boats belonging to Garside’s and later worked for A.C.Biggs, a local road haulier, still moving sand around the country. Batchworth Lock. The Linney and the Nellie. The final shipment of Leighton Buzzard sand was in April 1965. Twenty five years later in June 1990 an enactment was carried out with sand being tipped from original light railway skips into N/b Archimedes, an ex. Grand Union Canal Carrying Company boat, moored alongside Garside’s old wharf at Tiddenfoot . 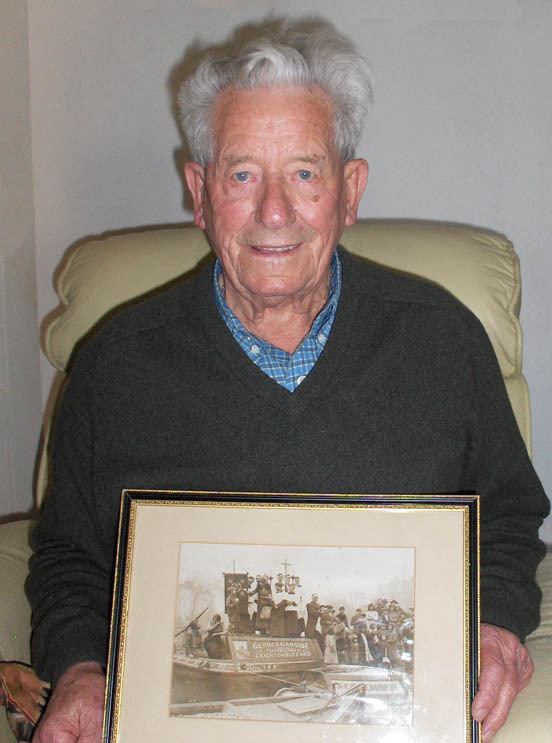 Canal transport of sand had provided early employment for William Vaughn of Friday Street Leighton in 1929 when he worked with his father on horse drawn canal boats belonging to Garside’s and later worked for A.C.Biggs, a local road haulier, still moving sand around the country. William Vaughan, the last boatman. 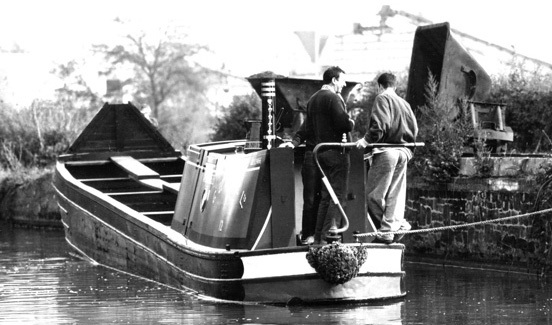 Commercial canal transport is still alive in several parts of the country and could well return to Leighton Buzzard with sand being transported to the new Olympic site in London.